My master bathroom is my oasis and the shower is the focal point of the whole room. 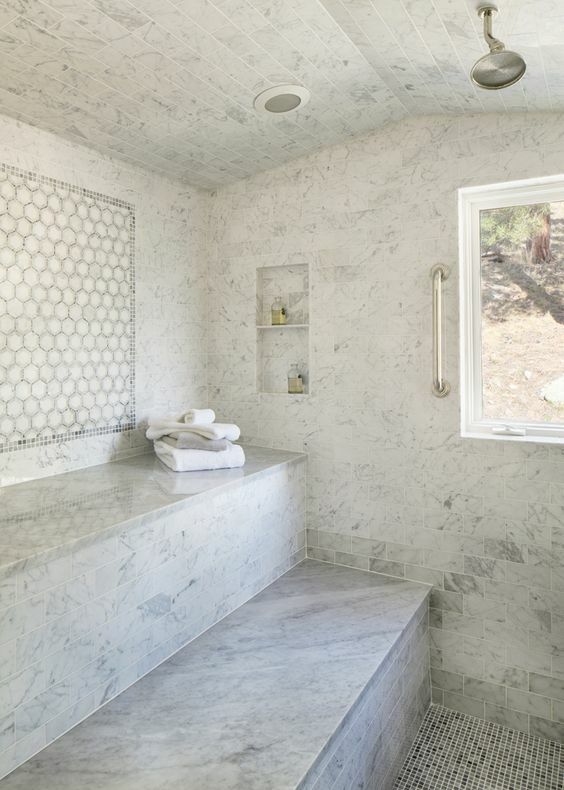 From glass to walk-ins, there are no limits to incredible shower designs. 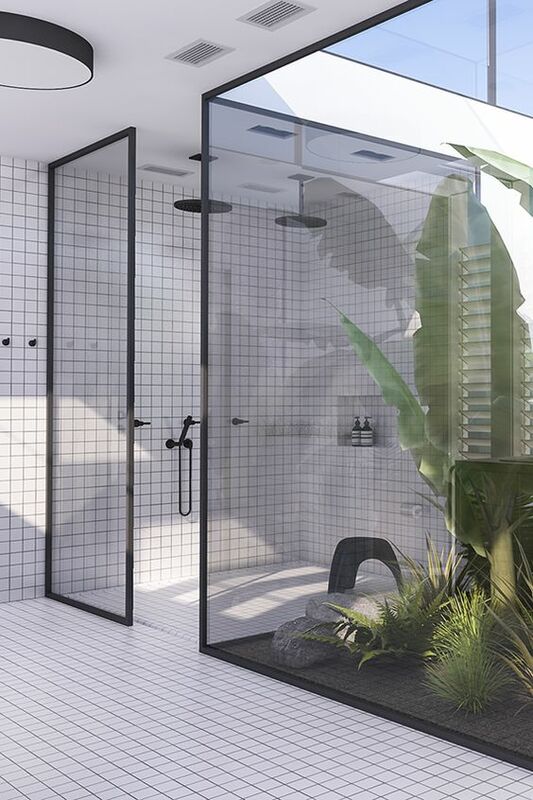 Whether you’ve been thinking about a bathroom revamp or not, browse through these stunning shower ideas that will transform your bathrooms! 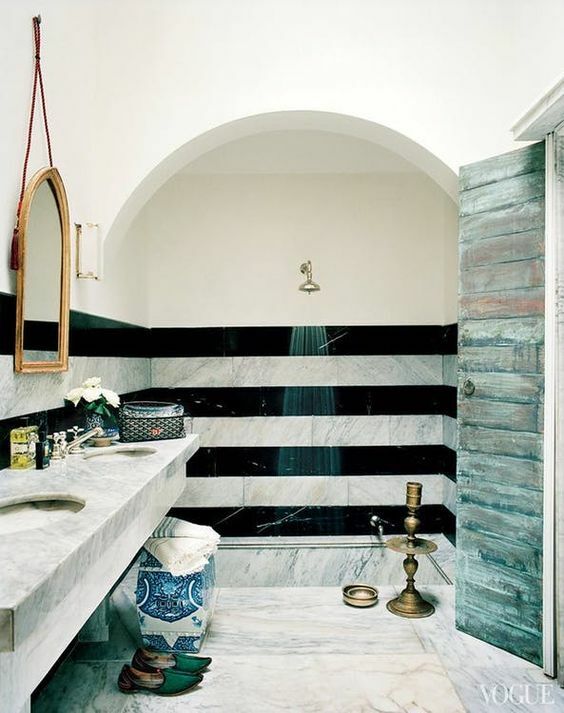 One of my favorite shower designs is also one of the biggest bathroom trends to date. 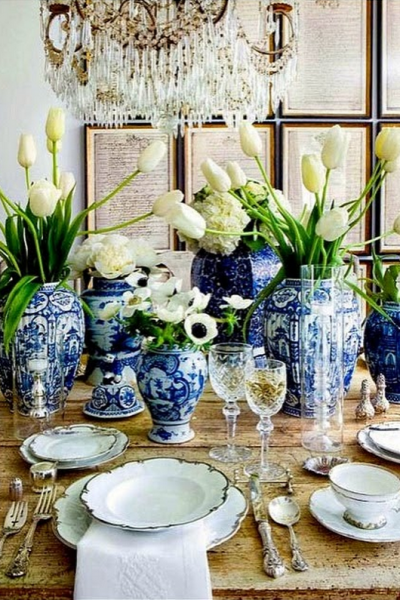 You’ll feel like you’re traveling abroad the Mediterranean with curvaceous architecture, blue-hued marble, and antique decor. Simple additions like standalone metals add the perfect touch of modern while keeping the overall design calming and luxurious. Imagine having a shower that made you feel like you were at the spa, every single day. Turning the design into a steam room inspired space will elevate your showers from simple soaks to therapeutic experiences. Keeping the tiles a neutral color will only add to the calming effect. Creating space for seating and storage will allow for ultimate comfort and function. Walk-In showers will open up a small bathroom and make it feel like you have more space. With the use of classic subway tile you’re able to implement any color imaginable. 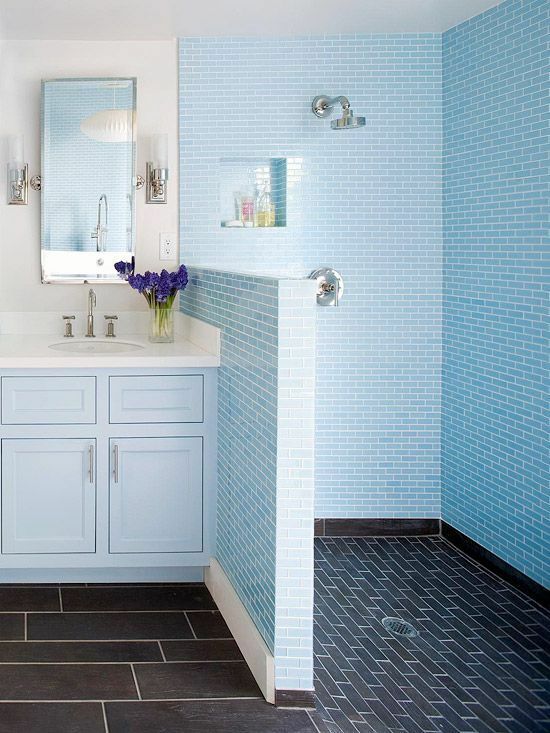 Pairing a walk-in design with a brighter color will make your bathroom feel light and airy. Dark flooring lets the brighter surrounding color do the talking, making it the beautiful focal point of the space. Walk-ins are a good solution for the elderly and disabled – offering no barriers to getting in and out. Personalizing a shower design may seem a bit risky, but can have dramatic effects. 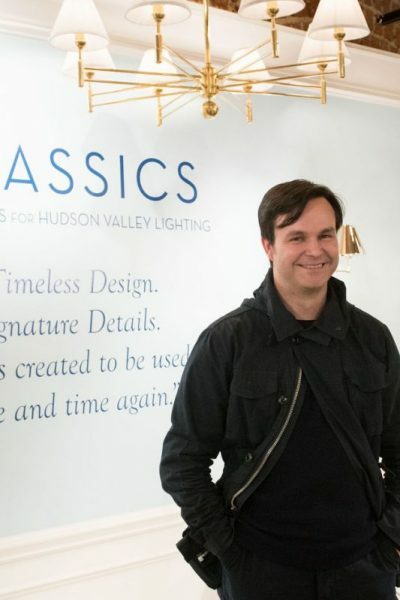 With a designated accent wall the design possibilities are truly endless. Add colorful accent tiles or a well-thought-out pattern like this floral scheme and you’ll have a breathtaking shower unlike anyone else’s. 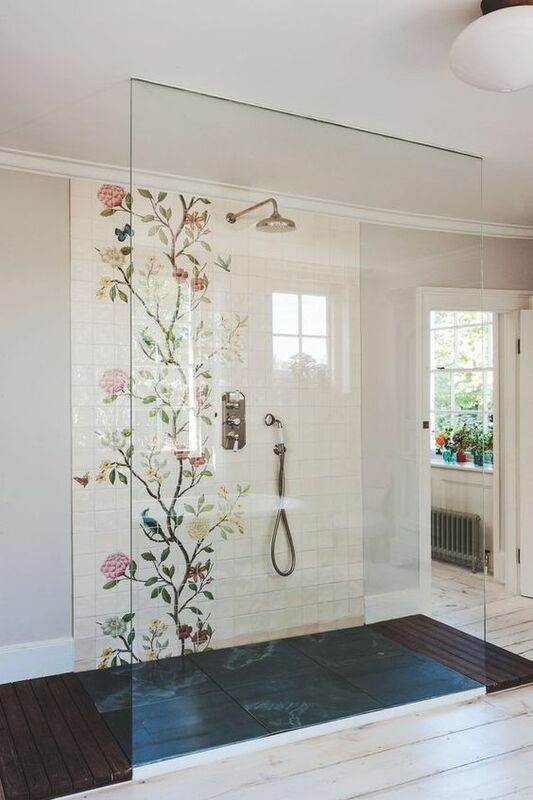 Bring the flora and fauna in with an all-glass shower providing gorgeous views to the outdoors. You’ll want immaculate landscaping to truly enjoy this effect, and a minimalist bathroom won’t overpower the views outside. It’s a zen-like experience that I can definitely get behind! The best thing about these stunning showers is the individual wow factor they bring to the table. Whether it’s the marble flooring, or easy design that caught your eye, be sure to recognize what makes a great shower for you. 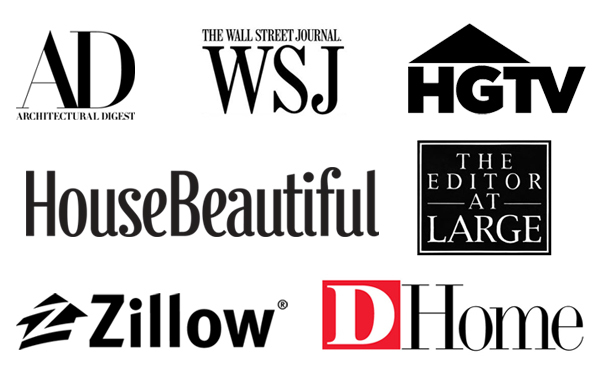 If you have a favorite design from these options, one that you just might implement into your own home, share your thoughts in the comments below!